The LUMAD children bore smiling faces while some yelled happily at the top of their lungs when they successfully jumped over ‘tinik’ (thorns) and made it on the other side unscathed. The joyous moment was a very rare opportunity especially for lumad children who lived with constant fear and uncertainty. The sounds of gunfire and presence of military elements inside their schools and communities brought everyday risks and threats to their dear lives. An art and play activity dubbed as Luksong Tinik: Palaro para sa mga batang Lumad was organized by SALINLAHI Alliance for Children’s Concerns and Children’s Rehabilitation Center (CRC) at the Binhi ng Kalayaan, Luneta park in Manila earlier today in commemoration of November as the National Children’s month. ‘The activity was participated in by almost 50 lumad children who form part of ‘Manilakbayan ng Mindanao 2015’, a 700 strong contingent composed of lumads, peasants, women, children and other sectors who journeyed to Manila to highlight the issue of militarization and plunder of their ancestral land’, said SALINLAHI secretary general Kharlo Manano. Through modified traditional Filipino and recreational games and visual arts including patintero, luksong tinik, uprooting the carrot, cat and mouse and face-painting, ‘the lumad children emphasized their plight, aspirations and demands, Manano explained. Adding twist to the games, Manano said that the lumad children need to get the books, food and peace sign at the end of ‘patintero’. The children compared the ‘taya’ or blocker to the soldiers who attack, encamp and harass them, making their access to education more difficult for them’, Manano said. According to Manano, thousands of lumad children are deprived of education due to the increasing and persisting cases of military attacks on schools in Mindanao. ‘Recently, the barangay captain of White Culaman, Kitaotao, Bukidnon assisted by the military forcibly closed down the Mindanao Interfaith Services Foundation Inc. (MISFI) while the teachers and students were harassed. This piles up to the long list of cases of military attacks even after the killings of Samarca, Campos and Sinzo caught local and international attention,’ Manano stressed. 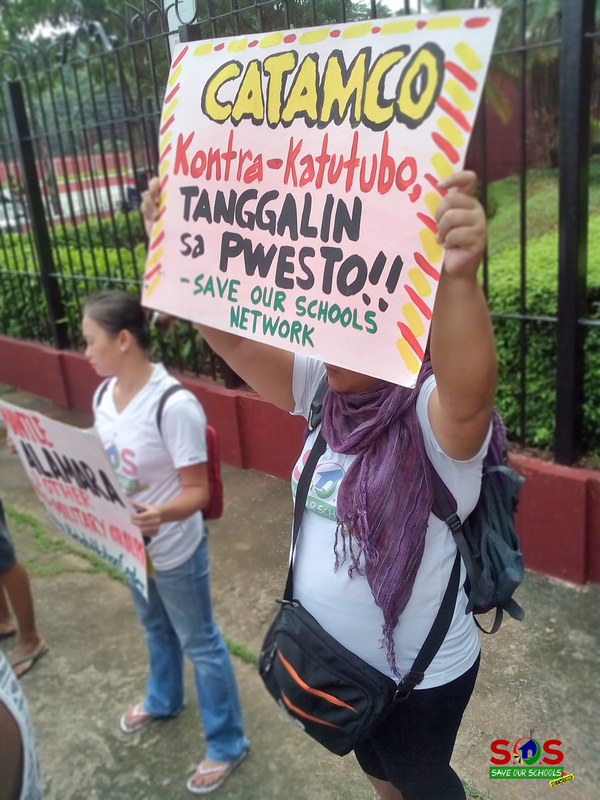 Save Our Schools network (SOS) joined the protest action led by Sulong Katribu in front of the House of Representatives today. The group called for the removal of North Cotabato 2nd district representative Nancy Catamco from her National Cultural Communities committee chairwomanship in the lower house and to end military attacks on IP schools and communities. Aside from further violations of human rights, the incidence proved how the Aquino government continues to turn a blind eye on the rights and welfare of indigenous peoples. “Even the United Nation Special Rapporteur on Internally Displaced Persons (UNSR IDP) Chaloka Beyani raised his concern over the plight of the 700 lumad refugees currently living in Davao City displaced because of the presence of military and paramilitary groups in their communities,” Manano continued. Beyani, in his statement, also mentioned his concern over the alleged forced recruitment of lumad into para-military group Alamara as well as the reported cases of schools being closed/or occupied by the AFP and Alamara, hampering the access to education of indigenous children. The network reiterated their call to hold Catamco, the AFP, PNP and BS Aquino accountable for the continuing rights violations of lumads in Mindanao. “We fear that the recent violence in Haran will possibly happen again, especially with Catamco instigating violence inside the sanctuary of the displaced lumads. How many more lumad children should fall victims in the hands of the fascist Aquino regime? We are calling all advocates to unite and echo the call for justice of the peoples of Mindanao, locally and internationally,” Manano ended.